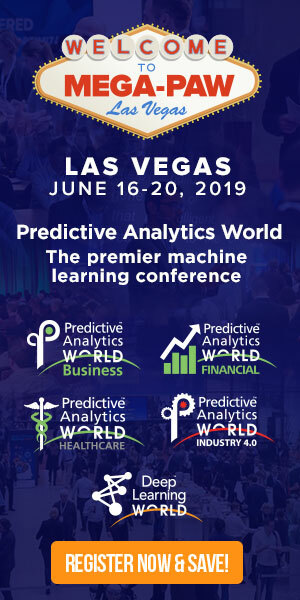 Eric Siegel, Ph.D., founder of Predictive Analytics World and Text Analytics World, and Executive Editor of the Predictive Analytics Times, makes the how and why of predictive analytics understandable and captivating. He is the author of the bestselling, award-winning Predictive Analytics: The Power to Predict Who Will Click, Buy, Lie, or Die, a former Columbia University professor who used to sing to his students, and a renowned speaker, educator, and leader in the field. Eric has appeared on Bloomberg TV and Radio, Fox News, BNN (Canada), Israel National Radio, Radio National (Australia), The Street, Newsmax TV, and NPR affiliates. He and his book have been featured in Businessweek, CBS MoneyWatch, The Financial Times, Forbes, Forrester, Fortune, The Huffington Post, The New York Times, Newsweek, The Seattle Post-Intelligencer, The Wall Street Journal, The Washington Post, and WSJ MarketWatch.